Let good vibrations wash over the "City by the Bay" with this brilliantly rendered digital print. San Francisco is known as much for the Golden Gate Bridge as it is for its Summer of Love. 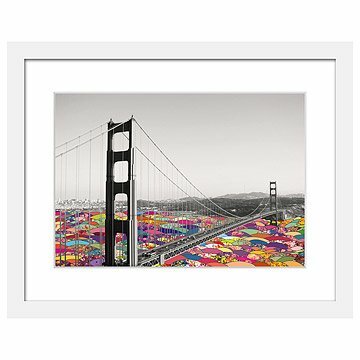 Celebrate this magnificent city and all the good vibes in the Haight with this stunning digital print. Artist Bianca Green is a global citizen, who has laid roots in Berlin, Rio de Janeiro, Montevideo, and, of course, San Francisco. Her love for the "City by the Bay" shines through in this stunning digital piece, printed on acid free paper and brimming with Bay area-intrigue. Made in Berlin, printed and framed in Portland, Oregon. Arrives framed and ready to hang in white BonanzaWood® frame, or unframed, matted in white acid free mat.